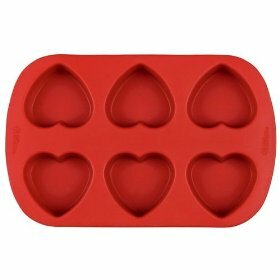 yesterday i bought this silicone mini hearts mold from wilton. every year i find myself wishing that i had more heart-shaped bakeware... so i finally broke down. i must say... i love it! i made cheesecake brownies in the molds, and they were a hit! i used a 13"x9" pan recipe, filled the molds, and put the rest of the batter in an 8"x8" pan. this is my first experience with the silicone as well... it's great to just invert the pan and have the cakes fall out with no prodding or missing pieces. i'm sure i'll be using this pan for many valentine's days to come!